Russian universities have a good reputation in the developing world, even though they are falling behind their Chinese competitors. Experts say this is because historically, Russian universities have always prioritized education over research. Russian universities rank in the top 10 among the so-called BRICS countries of Brazil, Russia, India, China and South Africa, but are struggling on the global scale, where they are not even in the Top 100. In a regional ranking released in mid December, the Moscow Lomonosov State University (MGU) came third among the best universities of the BRICS countries. The ranking was compiled by Quacquarelli Symonds (QS) World University Rankings in partnership with Russia’s Interfax news agency. China is clearly in the lead; its Tsinghua University and Peking University came first and second, respectively. In the BRICS Top 50, only six universities are Russian, while 22 are Chinese. This is the first regional QS ranking focusing on the BRICS nations. Experts assessed the quality of education, the reputation of university graduates among employers, the numbers of foreign students, and academic achievements (based on the number of publications and references). There was also one new factor taken into account: the proportion of teachers holding academic degrees. Even though Russia has clearly lost out to China in the ranking, it must be said that on the whole, the findings of the QS survey have not been particularly harsh on the Russian higher education system. Two weeks before the QS ranking came out, Britain's Times Higher Education journal published a similar rating of universities in developing countries. The first two positions in that ranking are also held by Tsinghua University and Peking University. MGU, however, is ranked only 9. 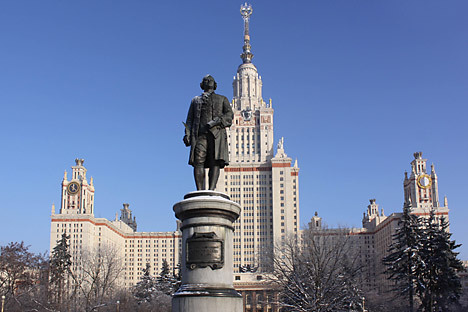 There is only one other Russian entry in the ranking, St. Petersburg State University, which came ranked 67. The British journal noted that “Russia is in a state of depression," and that it’s education system has retired into its own shell. The ranking also reflects the fact that research papers published in Russian are not widely used in the rest of the world. Sometimes Russian universities don’t have even the most basic English-language information about themselves on their websites. As a result, it is impossible for international agencies to assess them in their rankings. In the Times Higher Education global ranking of universities, which was released in October, Russia is among the outsiders. Not a single Russian university has made it to the Top 200. There is only a single Russian entry, the MGU, in the Top 400. According to the QS global ranking, MGU is 120, St. Petersburg State University is 240, and the Moscow Bauman University of Technology is 334. \The best university in the word, according to QS, is the Massachusetts Institute of Technology, followed by Cambridge and Harvard. Every one of the recent international university rankings has been a painful blow for the reputation of the Russian higher education system. The government and the academia insist, however, that these rankings do not accurately reflect the real situation, and want to introduce their own ranking system. In July, President Vladimir Putin instructed the Education and Science Ministry to develop a set of criteria for a Russian national ranking of universities. In late November the idea was echoed by the MGU president, Viktor Sadovnichiy. "I think that there needs to be a new ranking system that would reflect the classic university model. We are ready to provide the HQ for such a ranking system here in Russia. Let us try to assess universities as centers of culture, education and science. Universities have strong traditions that play a huge role in their countries." Nevertheless, the Russian government is also aware of the importance of international recognition of the Russian education system. It is planning to spend 35 billion rubles on bolstering the prestige of Russian universities. One of the targets is to have some Russian entries in the QS international Top 100 ranking. Apart from the MGU and the St. Petersburg State University, which have a separate funding allocation in the federal budget, 15 other universities will also receive government money. These include the Far Eastern Federal University, the Moscow Institute of Physics and Technology, the Higher School of Economics, and the Samara Korolev Aerospace University. Prof. Irina Abankina, the head of the Institute of Education at the Higher School of Economics, says that international rankings help the graduates of the higher-ranking universities find employment. “Foreign employers prefer to hire these graduates; that is especially true of high-tech companies investing in the Russian IT sector or in the production of expensive medical equipment." Abankina added that there are some historical reasons why Russian universities are not faring very well in the international rankings. “Three quarters of the criteria used in these rankings measure the quality of university research, and only a quarter the quality of education. Here in Russia, research is not concentrated at universities, and there are historical reasons for that. In Russia, the top priority for universities is to educate students; research is done at separate centers and academic institutes,” she said.